Tucked away on a street in Samcheong-dong in Seoul, GLOBO Coffee Faktory is an unassuming cafe front with a gorgeous secret hideout deep within it. 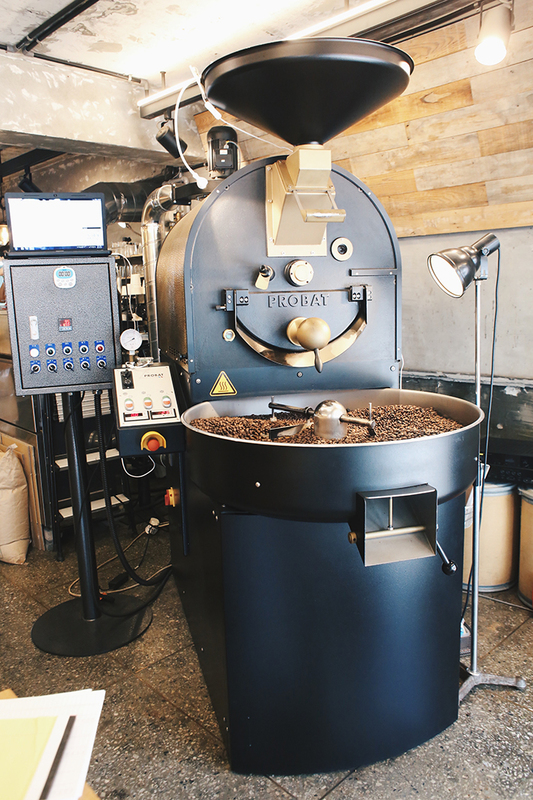 If you stroll into the cafe, you will be greeted by a massive coffee roaster as the cafe roasts their own beans. We knew we had to have a taste of their coffee after being pleasantly overwhelmed by the aroma of coffee beans. Little did we know that deeper into the cafe, is a patio with indoor and alfresco seating with natural sunlight streaming in. How delightful! 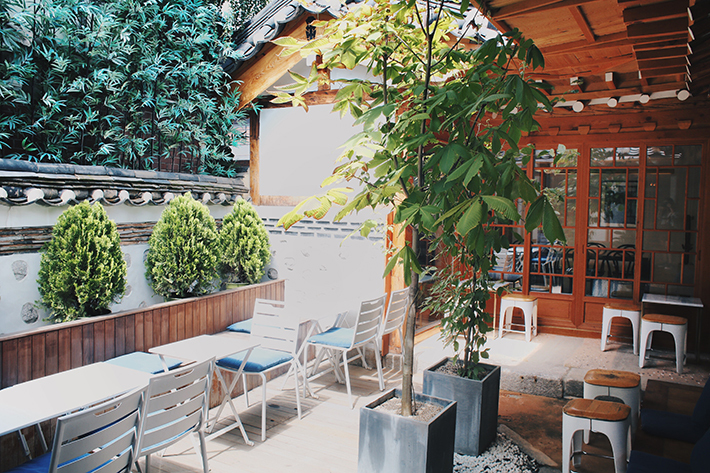 The patio at the back of the cafe is probably one of the most photogenic spots we have stumbled upon in Seoul, South Korea. The quiet and intimate ambience makes the patio a great place to sit and relax for a bit while sipping on some amazing coffee. The patio area is amazing. The contrast of old and new makes the area so ethereal. Think bamboo bench seats, white stones and potted plants alongside cobalt blue sofa seats and Parisian-like white tables and chairs. However, if the weather is too warm, you can also take a respite from the sun indoors. The indoor seating area just beside the patio is small but cosy with gold and marble tables and comfortable sofa seats. You can read, catch up on work or simply relax with a drink or a dessert here for a calm and stress-free afternoon. To order some drinks and desserts, you would have to head to the front of the cafe where the massive roaster is. 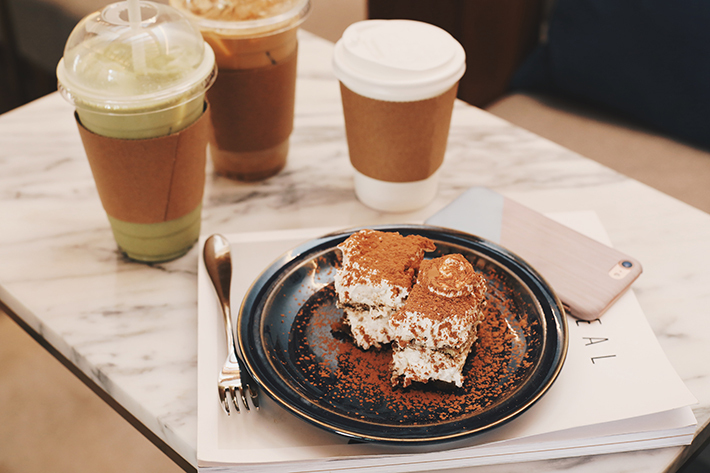 We purchased an Iced Latte, Iced Matcha Latte and a Tiramisu cake as a light snack before lunch. The coffee is just as fantastic as we anticipated. The aroma of the coffee was distinct, even in an iced latte. The beans tasted different from the usual Australian beans we have regularly. It was stronger and packed a punch. The Iced Matcha Latte was nothing to shout about but it was a pleasant treat nonetheless. It was not overly sweet and it went well with the dessert we ordered. The Tiramisu was light and the sponge cake inside was fluffy and airy.